As my time in Greece is ending (for now) I realize that since November I keep promising people that I will write about how I have been feeling the last couple of months but I never actually did it. I have often tried to share some thoughts but I couldn’t express my feelings. I remember that after my first week in the field I described it to my boss as a cocktail of extremes. I think this is still the best way to describe it. There are moments of pure bliss when someone gets good news or when a child runs to you and has a look of happiness in his eyes (this look will make your heart melt and forget where you are! ), to moments where I felt completely hopeless and sad after hearing bad news or seeing something happen in the camps. Feeling extremely sad or happy can occur in the span of a few minutes and this is why when friends back home would send me a message and ask how my day was I could never say ‘fine’ or ‘ok’ because these words can’t fully describe what I have been feeling throughout the day. It’s really a rollercoaster of emotions. Another ingredient in my cocktail of extremes was the priviledged position I was in. First off the fact that I had a warm home to welcome me when I left the camp and a roof over my head while working with people who didn’t have that. I remember walking around the tents when it was storming and people actually asking me to come inside so I could warm up and me thinking that for me this is only a few hours and I know at some point I can go home and warm up but for them it is daily life and still they felt compassion with me. I would just walk around with an incredible sense of guilt but also admiration for the fact that they were offering me help. Another privilege was the fact that I was lucky enough to already have this precious piece of paper which allows me to travel freely. The children I worked with used to ask me how I came to Greece thinking I had a story like theirs while I just hopped on a plane and landed in Greece. Their stories consisted of trying several times via Bulgaria, being arrested, sent to Turkey or running away from the police and hiding somewhere only to be caught eventually and after many failed attempts their parents deciding to go via the sea. All the organizations working with refugees are trying day in and day out to bring some kind of normality into an abnormal situation. Sometimes I would notice that there were people for whom this situation was starting to normalize which I think is dangerous. 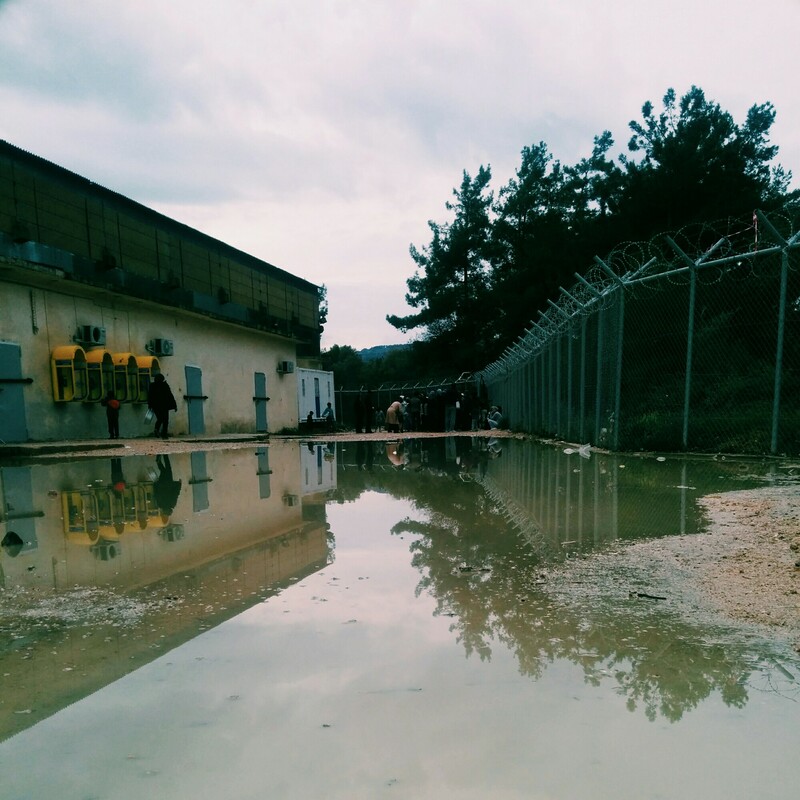 There’s nothing normal about the conditions people have to live in just because they decided to flee from war. There’s nothing normal about the way people get treated in some occasions by officials. There’s nothing normal about the fact that back in the country of origin there was a house, a job and most importantly a name but once a person arrives on the islands that all is forgotten. You become a number, you are your police paper and registration number. You are a refugee, an immigrant, an asylum seeker, a beneficiary or an applicant, depending on which organization is referring to you. You wait in line for breakfast, you wait in line for lunch, you wait in line for dinner. You wait in line for clothes on your back and you wait in front of a metal gate hoping someone will notice you so you can go to the doctor or some other facility hidden away inside. You wait 11 months in limbo not knowing what will happen with you or your family. Most importantly: it is expected of you to keep your cool regardless of everything. You are surrounded by barbed​ wire but somehow you have to stay calm and feel at home between these metal walls even if you have no idea how long you might stay here. There have been many incidents where people have lost their patience but can we really blame them? However, what I also learned from this is how strong human beings are, despite the horrible surroundings celebrations would still take place. Be it for a national holiday like Nowrooz or people getting engaged. Life goes on also in less than perfect circumstances. There’s laughter and music and a lot of strong spirits coming together which is incredibly inspirational. I was always sceptical of NGO’s and other organizations when I was in Holland but I have met some great people who really care and have invested much time and effort in giving support where needed. That was amazing to experience and it restored some of my faith in humanity. So, if you are considering volunteering or working in Greece and investing some of you energy in trying to help out, go on and do it! I highly recommend it because the need is high. Specially if you are an Arabic or Farsi speaker. If you need advice on which organization to work with let me know and I will gladly try and help you sort it out if possible. I think this post was quite long but if anyone wants to know something else feel free to ask whatever it is that you want to know.